Fun Friday: Welcome Back Summer Timeline, I missed you! I couldn’t do it alone this year. If you’ve been a regular reader of my blog over the years, you’re familiar with our Summer Timeline that I started a few years back. It was my version of a clothesline timeline I’d seen on a blog one day years ago that I’d decided to adapt for a project at our house that summer of 2012. It was a huge success. We easily filled our timeline with pictures and events from our summer and at the end of it all we had a great way to look back on all the fun things we’d done. Later on that fall we put the pictures and labels into a scrapbook to preserve the memories forever. Last summer we did it again, extending our timeline around the room and being quite liberal with the photos we added, knowing that we’d be adding to the summer scrapbook from the year before. We loved the timeline of 2013 and left it up for a long time. And then, we left it in a pile on the floor in the corner of my bedroom for the next ten months. I was out of 12×12 scrapbook page sleeves to do the newest pages. I had no double-sided tape to add the photos in. I’d get some. Soon. Next time I went to the craft store when I wasn’t spending a lot of money on something else that I needed right away. We had an incredibly hectic school year this year, probably the most difficult yet, since all three started school. The time never quite made itself available to us, and the timeline and scrapbook were never a priority. It kept going on the “some day” list and before I knew it, it was summer again. And so, the burning question: Do we do another summer timeline? It didn’t really matter what the answer was, ultimately, because at the end of the school year I didn’t have a single spare second to put it up. It doesn’t take forever, but it takes a little bit of time, and we were out flat with commitments at the end of the year right up through the night of the last day of school when three kids had to be in three different places at the same time all by 5pm, with me as the sole driver. The timeline greeting my kids on the last day of school as they walked through the door just wasn’t going to happen. Well, it was a nice idea while it lasted. Fun when we did it. Maybe some other time we’d do it again. But, that first week of summer, I already missed it. We ate out one night after a full day of dance recital rehearsals (with lots of photo opps) grabbing dessert at a dairy farm where there were cows and chickens and gorgeous farm scenery. I was snapping away, taking loads of pictures. We went strawberry picking for the first time ever since I was a kid. It was a gorgeous, sunny day. The berries were red and ripe, the leaves of the plants bright green and there wasn’t a cloud in the sunny blue sky. It was picturesque. We went letterboxing for the first time of the season. The letterbox was in a location that had a historic memorial garden. We toured it, taking photos of World War II Quonset Huts and war memorial statues and plaques, an amazing letterbox for our first find of 2014. Water slides, light houses, lunches out at local hot spots. Luckily as things usually go for us, we had a sick day one day shortly after the water slides and light house day. We had some down time, time when we were stuck at home. 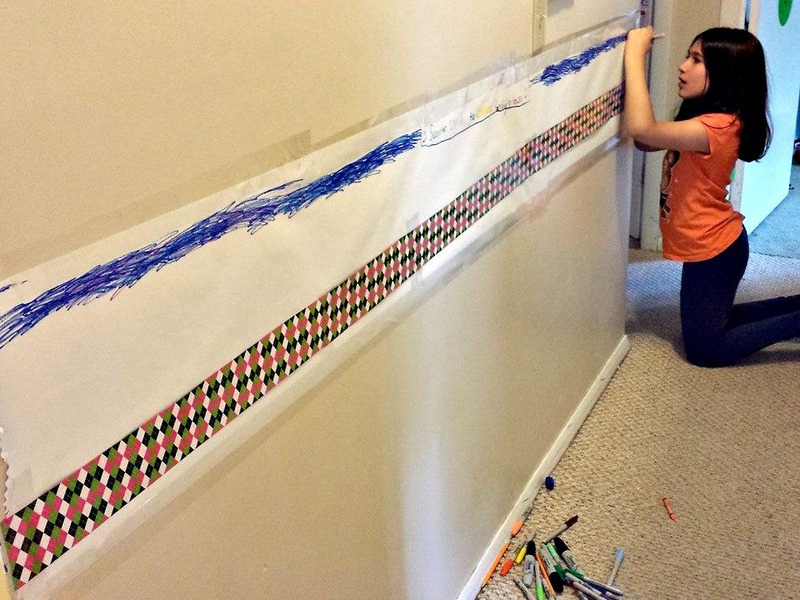 I noticed the blank wall in our hallway, a nice, long stretch of space that would make a great summer timeline spot for 2014. It wasn’t a spot we’d used before, but it looked inviting. And so, up it went on that afternoon, but this time, I had some help. Alex was going a bit stir crazy that day, not being the one who was not feeling well, and looking for something to do. I had her help me, and although giving up a sense of perfection is hard for me, giving up all creative control isn’t something I do well, I turned the whole project over to her. We put the paper up together and put the strip down the middle together because those are the two hardest things to do. “Mommy,” she said. “How did you DO this all by yourself before?” she asked. “Can I decorate it a little bit?” she asked. And so she went to town, occupied for a good half hour at least, adding a sky, some blue and purple tones to it, some happy faces, hearts and flowers. My hands were free, my worries about to do or not to do the timeline were gone, and it’s up on the wall. Yesterday I bought refill sleeves for last year’s photos and I bought a pack in advance for this year’s. It’ll all get done. It doesn’t really matter when, in the grand scheme of things. I stand by the fact that anything we can accomplish in the memory preserving category is more than nothing, and that’s something. We love our summers most of all, the time we spend together and the fun activities we do, and once again this year, we’ll have the summer time line from 2014 to look back on when we enter the rat race of the 2014-2015 school year. Digitize your timeline and you’ll be all ready when the time comes for the wedding video! Plus you can easily share it.